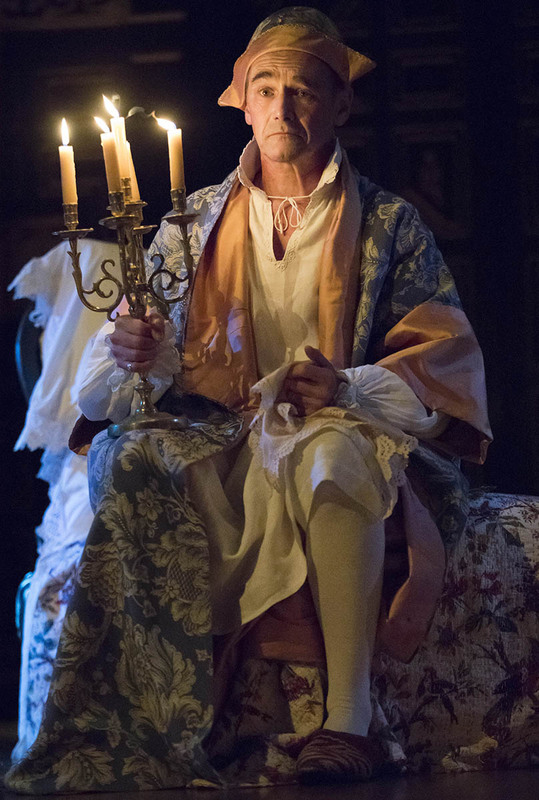 Even before Farinelli and the King opened on Broadway at the Belasco Theatre, I was chomping at the bit in anticipation of seeing the ever brilliant Mark Rylance unleash his incandescent magic once again. Rylance was the winner of three well-deserved Tony Awards for Boeing-Boeing (2008), Jerusalem (2011), and Twelfth Night (2014), an Oscar for best supporting actor in Steven Spielberg’s “Bridge of Spies” (2015) and a number of Olivier awards. It was enticing enough to have me drooling. Unfortunately, like the proverbial Humpty Dumpty, the same fate seems to have befallen Rylance in this production. 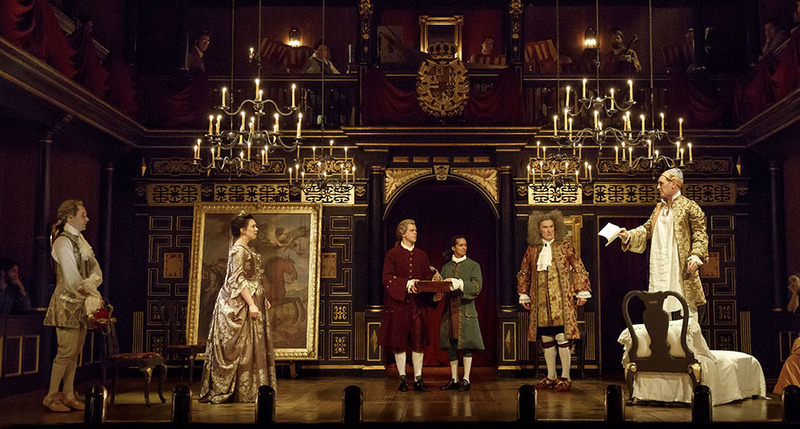 Like all the king’s horses and all the king’s men, neither could the diverse cast, try as they may, rescue Rylance from his surprisingly wobbly performance as Spain’s unstable King Phillipe V (1683-1746). 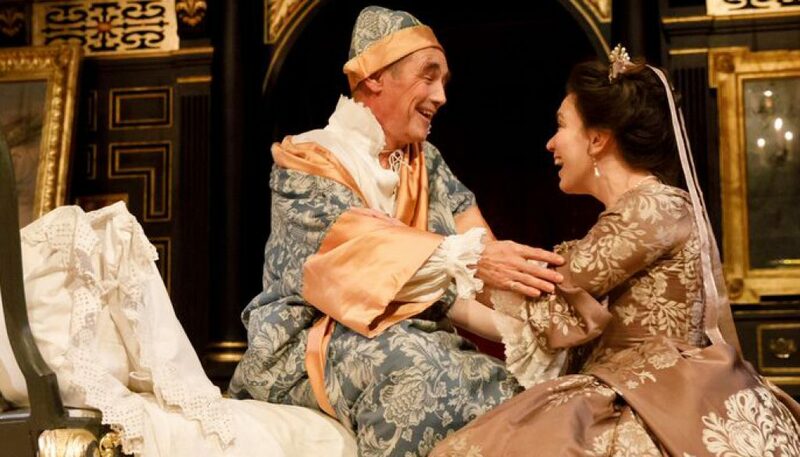 Perhaps the fault could also be partially blamed on Rylance’s real-life queen, his wife Claire van Kampen, who was responsible for the historically-accurate, but all too sparsely written play. And it was not for not trying. In real life Rylance is the son of a gestalt therapist. He pulled out every idiosyncratic acting trick in his by-now-familiar repertoire from his quirky timing, verbal and physical hesitations to his slyly audience-delivered asides. 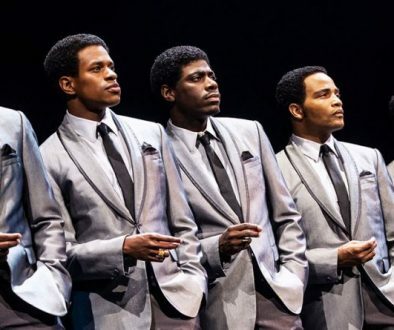 Unfortunately, the play, which gave the audience little to take home other than seeing The Great Man do his stuff (which admitedly for most was enough), did him no favors. Sadly, what could have been an extremely successful husband and wife pairing, fell disappointingly short. The story, as thinly fashioned by Van Kampen, is something akin to a ménage a trois. It centers around the king, who is given to sudden fits of manic depression and severe bouts of melancholia, his doting queen, Isabella Farnese (nicely underplayed by Melanie Grove) and Carlo Broschi, better known as Farinelli, the Italian castrato (castrated at the age of ten) who became a sensation in opera houses and concert halls of 18th century Europe. At the height of his fame, Farinelli gave up his celebrated career so to sing privately and exclusively for the king. As history tells us, Phillipe would lay in bed in his own excrement, refuse to dress, bite himself, howl into the night, stare out his window, talk to himself, and play with clocks. The king’s chief minister Don Sebastian de La Cuadra (an annoying over the top Edward Peel) and his royal physician Dr. Jose Cervi (Huss Garbiya) question the king’s sanity and even openly talk about the possibility of Phillipe’s abdication. As the story unfolds, we see the only thing that appears to soothe Phillipe, to give him the peace of mind he so craves – be it at his royal residence or at a forest retreat – is the ethereal voice of Farinelli. Accompanied by a trio of musicians, Farinelli would sing eight or nine arias every evening for the pleasure of the king. There are things to admire in the play. 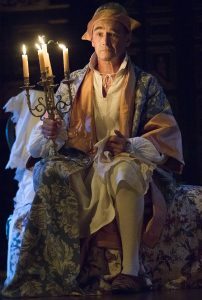 Jonathan Fenson’s masterful production design, John Dove’s wise and perfect choice of using period instruments, no amplification, hanging candelabras with candle lights instead of electric lights that would emulate the same, and authentic period costumes, beautifully resurrect the 18th century. The tail wagging the dog conceit of the production – is the casting of three separate Farinellis. 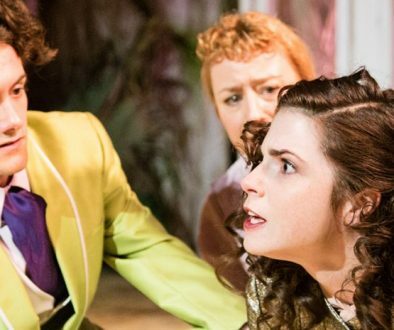 One Farinelli, the wonderfully sympathetic and highly believable Sam Crane, who inhabits the play’s emotionally finest moments, handles all of Farinelli’s acting moments. Meanwhile, countertenors Jestyn Davies and James Hall (on alternate days) do all of the singing of Handel’s baroque arias on alternate days. The night I attended the play both Crane and Davies, costumed and wigged exactly alike, stood side by side, one shadowing the other. A surprising “La La Land” moment came – the only bit of magic in the play – when Davies, suddenly soared in the stars leaving Crane earthbound during the singing of one aria. The mini-highlight of the evening, certainly the most emotional moment in the play, came as a complete surprise with nothing in the play giving even a hint to it. This was an admission of love between Farinelli and the queen. As far as I know, this love triangle might have been a fictitious moment dreamed up by the author. However, it did open up a whole new can of spicy worms and triggered, certainly in myself, some much needed heart fluttering that the play failed to do before or after. Unfortunately, this heated moment came too late in the play to add up to anything other than a throwaway teaser. In a certain sense, the same could be said about the play itself. Farinelli and the King plays at the Belasco Theatre, 111 West 44th Street, from now through March 25, 2018. For more information, please check their website. 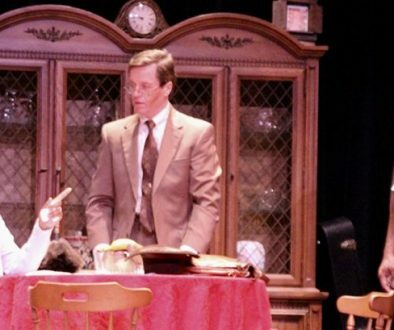 Directed by John Dove, the play written by Claire van Kampen, who also serves as musical arranger, runs two hours and 30 minutes. Cast: Sam Crane, Iestyn Davies, Huss Garbiya, Melody Grove, James Hall, Lucas Hall, Colin Hurley, Edward Peel, Mark Rylance, Peter Bradbury, Eric Jurenas, Margot White.